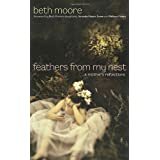 Feathers from My Nest: A Mother's Reflections ReviewAs my nest is emptying (our youngest went off to college this fall), I look at those "empty nest" books with a combination of hesitancy, desire to know someone else's experience, and disbelief that I am really at this stage. It seems we just brought our first baby girl home from the hospital (it was only 22 years ago, which often seems more like 22 months!). I'm thankful to the Lord for my children and for my dear husband - that after all these years, we still have things to talk about, experiences to share, and plenty of love left for each other. So I opened this book, not real eagerly, I must confess - after all, this was about a book that I really wasn't ready for! The 4-page introduction "Feathers from My Nest" alone is worth the price of this book! Talk about telling it like it is! Mr. Sparrow is talking to Mrs. Sparrow as she's trying to gather feathers from her nest - memories to take with her on their new journey together. I have to thank Amazon for making it possible to get a better look inside the books we buy from them - the pages you will see are part of the first chapter of the book AFTER the intro I just mentioned. You'll get an idea of Beth Moore's writing style. Each chapter talks about a certain "feather" that's been left behind in Beth's nest when her two daughters flew away. One chapter is "The Crumpled Kleenex". Mom spends some time in her daughter's bed after the daughter leaves home and she finds this kleenex and she wonders what the tears were about. "The Binders" talks about one of her daughter's method of proclaiming that she was making a new start with her schoolwork - this chapter has lessons for us all on the grace of God. "The Magazines" chapter discusses the family's struggle with how our society values skinny women and how it impacted one of their daughters and their fight to pull her from the clutches of an eating disorder. And "The Green Cap and Gown" is about graduation, of course. The last chapter is entitled "One Slightly Gray, Well-Seasoned Man" and is about her husband Keith. A perfect ending for this story of feathers left in their nest. Beth is looking forward to the rest of her life with this wonderful man who was there at the beginning - before there were little chicks to leave feathers behind! This book is a fabulous book for moms of all ages. Don't think that it's just an "Empty Nest" book. If you have children getting ready to try out their wings, this is a must-read. I haven't read Beth Moore's other books (most notably "Breaking Free" and "Praying God's Word"), but I would like to. If you have a child in high school or college, you simply must read this book. My other very-favorite book on parenting older kids is "Give Them Wings" by Carol Kuykendall, which covers parenting from driver's license to leaving home. Excellent book! Want to learn more information about Feathers from My Nest: A Mother's Reflections?